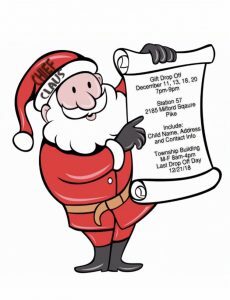 Santa Clause will be escorted by your Volunteer firefighters on a fire truck throughout Milford Township Fire Company “1st due” response area on Christmas Eve. Drop off your small wrapped gift at Station 57 on designated dates and include the following: Child name, Address, and Contact info. Please type or print info clearly. Santa will arrive between 5pm-9pm, no time requests will be accepted.